Since the very beginning back in 1919, See Ya Later Ranch Winery has had a reputation for their great love and support of animals – particularly those of the furry canine variety. This long history of puppy love all began with the winery’s first ever owner, Major Hugh Fraser. A colourful and spirited character, the Major is fondly remembered for his sense of humour, love of entertaining, and firm devotion to protecting pups of all sorts. These days, See Ya Later Ranch cheerfully carries on this legacy through pooch-friendly grounds, the loving tribute of a doggie cemetery, and a strong relationship with the Okanagan Chapter of the BC SPCA. 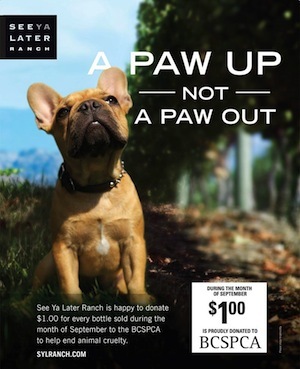 In addition to its’ puppy-centric events and in-kind donations, all year round See Ya Later Ranch donates 50 cents from each sale of the Jimmy My Pal wine to the BC SPCA. $1 from every bottle of See Ya Later Ranch wine sold at BC Liquor stores and private liquor stores in British Columbia to the BC SPCA. See Ya Later Ranch proudly donates over $20,000 per year to support the BC SPCA and their efforts to promote the safe and humane treatment of animals. This September lab-lovers, bulldog-buffs and everyone in between can show their support all while sipping their favourite See Ya Later Ranch wines.